Galileo De Obaldia Soza from Panama is no stranger to the competitive Yu-Gi-Oh! TRADING CARD GAME scene. He has won a WCQ, a YCS, AND a World Championship, and has competed in the Yu-Gi-Oh! TRADING CARD GAME World Championship a whopping 4 times! 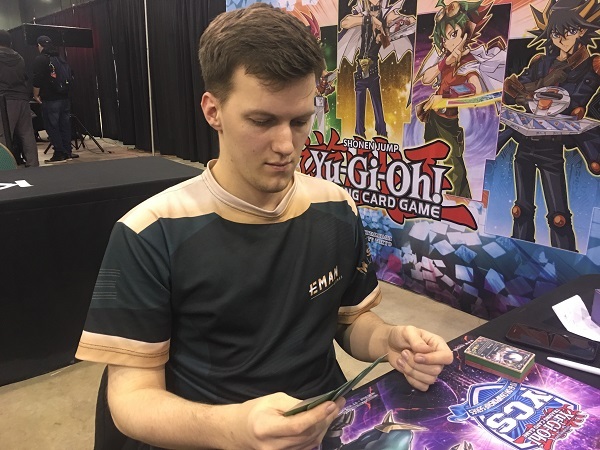 Now he’s in the Top 32 of YCS Chicago with his Sky Striker Deck, and he’s facing off against Jonas Koschel from Germany! 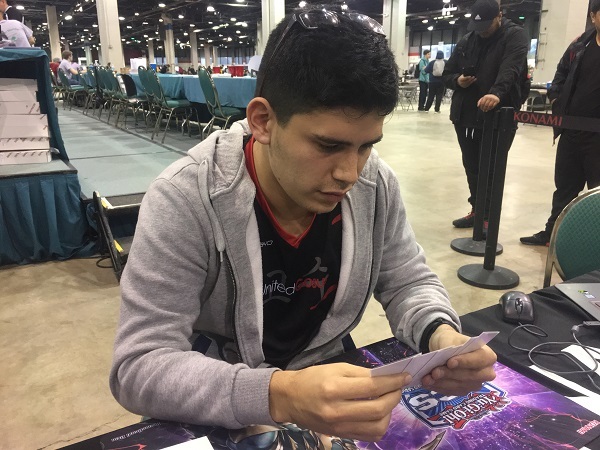 Koschel was the runner-up at Germany’s National Championship last year and has made it to the top cut of several YCS tournaments in Europe, but doesn’t quite have the major victories that De Obaldia has claimed. Koschel is using a Danger! Thunder Dragon Deck this weekend, and he’s hoping it’ll allow him to best the former World Champion so that he can advance to the Top 16. It’s time to Duel! De Obaldia won the die roll and chose to go first. He opened up with Twin Twisters, Shared Ride, Heavy Storm Duster, Sky Striker Mecha – Eagle Booster, and Sky Striker Mobilize – Engage!. He activated Engage to add Sky Striker Ace – Raye from his Deck to his hand and then Normal Summoned Raye. He sent it to the Graveyard to Link Summon Sky Striker Ace – Kagari and used Kagari’s effect to return Engage to his hand. Next, he activated Engage to add Sky Striker Airspace – Area Zero from his Deck to his hand. He activated it and then Set Heavy Storm Duster face-down. He used Area Zero to destroy the Heavy Storm Duster and add an Engage from the top of his Deck to his hand and then activated the Engage to add a Sky Striker Mecha – Widow Anchor from his Deck to his hand. He Set 3 cards and then used Kagari as a Link Material to Summon Sky Striker Ace – Shizuku. He activated Shizuku’s effect in the End Phase to add Sky Striker Mecha Modules – Multirole from his Deck to his hand. Koschel discarded Thunder Dragon from his hand to activate its effect and De Obaldia Chained Shared Ride. Koschel added 2 copies of Thunder Dragon from his Deck to his hand and De Obaldia drew a card. Next, Koschel used Allure of Darkness to draw 2 cards and banish Thunder Dragonroar from his hand. He used Dragonroar’s effect to Special Summon Thunder Dragondark from his Deck and then Special Summoned Black Dragon Collapserpent by banishing Thunder Dragon from his Graveyard. He Normal Summoned Thunder Dragonmatrix next, and sent it to the Graveyard with Collapserpent to Link Summon Knightmare Phoenix Linked to Shizuku. He activated Phoenix’s effect and discarded Thunder Dragon to target De Obaldia’s face-down Eagle Booster, and activated the effects of Collapserpent and Dragonmatrix as well. De Obaldia Chained Eagle Booster, and Koschel added another Dragonmatrix and a White Dragon Wyverburster to his hand. De Obaldia drew 2 more cards thanks to the effect of Shared Ride. Next, Koschel Tributed Thunder Dragondark to Special Summon Thunder Dragon Colossus and used Dragondark’s effect to add Thunder Dragon Fusion from his Deck to his hand, allowing De Obaldia to draw another card. 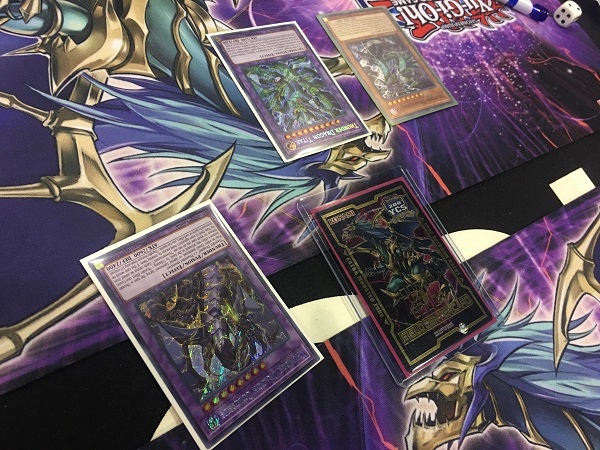 Koschel activated the Thunder Dragon Fusion and shuffled 2 Thunder Dragons and a Thunder Dragonmatrix back into his Deck to Special Summon Thunder Dragon Titan. He discarded Thunder Dragon from his hand to activate its effect and then Chained Titan’s effect; but De Obaldia Chained Widow Anchor to target Titan and take control of it. Koschel added 2 Thunder Dragons from his Deck to his hand. Next, Koschel activated the effect of Danger!? Jackalope? from his hand. He randomly discarded Thunder Dragondark from his hand and then Special Summoned the Jackalope and drew a card. He Special Summoned Wyverburster from his hand by banishing Thunder Dragondark from his Graveyard next, and then sent all 4 of his monsters to the Graveyard to Summon Saryuja Skull Dread! He activated its effect along with the effect of Wyverburster. 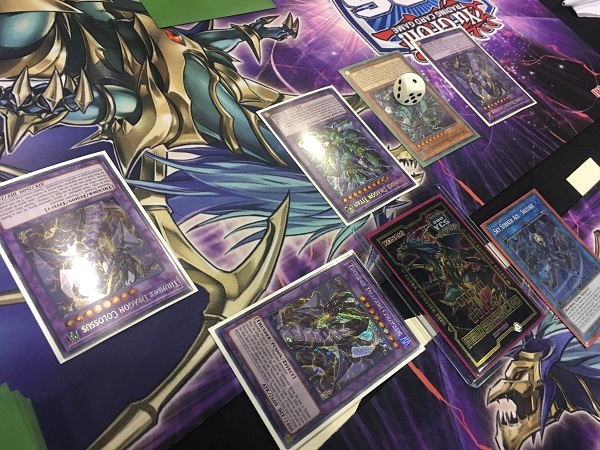 He added a Collapserpent to his hand, allowing De Obaldia to draw a card, and then drew 4 cards with Saryuja’s effect and sent 3 cards from his hand to the bottom of his Deck. He activated Allure of Darkness next, drawing 2 cards and banishing Danger! Nessie! from his hand. He used Saryuja’s effect to Special Summon Thunder Dragon from his hand and then Tributed the Thunder Dragon to Special Summon Colossus in Defense Position, Linked to Saryuja. It gained 300 ATK and DEF due to Saryuja’s effect. He Set a card to his back row and then passed his turn, regaining control of his Thunder Dragon Titan. De Obaldia drew a card for his turn and then had 9 cards in his hand! He activated Twin Twisters by discarding another Twin Twisters to target his own Area Zero along with Koschel’s face-down card; but Koschel Chained the targeted Eradicator Epidemic Virus and Tributed his Colossus! De Obaldia Chained 2 copies of Widow Anchor to try to take control of Titan and Saryuja, and Koschel Chained the effect of Thunder Dragonmatrix by discarding it from his hand. De Obaldia Chained Twin Twisters so that Koschel wasn’t able to use the effect of his Titan! De Obaldia Special Summoned Raye from his Deck with the effect of Area Zero after taking control of Titan and Saryuja, and then direct attacks from Titan, Saryuja, Shizuku, and Raye wiped out all 8000 of Koschel’s Life Points! Galileo De Obaldia takes the first win in spite of Koschel’s activation of Eradicator Epidemic Virus! Koschel started went first in Duel 2 and De Obaldia Tributed Artifact Lancea from his hand to activate its effect in Koschel’s Draw Phase. Koschel used the effect of Danger!? Tsuchinoko? and randomly discarded it from his hand to Special Summon it. Next, he used the effect of Danger! Nessie! in his hand and randomly discarded Thunder Dragon Fusion. He Special Summoned Nessie and then Normal Summoned Batteryman Solar. He activated its effect to send Thunder Dragonroar from his Deck to his Graveyard and then discarded Thunder Dragonhawk from his hand to Special Summon the Thunder Dragonroar. He Special Summoned a Token to the field with Solar’s effect and used the Token to Link Summon Linkuriboh. He sent Linkuriboh, Tsuchinoko, and Nessie to the Graveyard to Link Summon Curious, the Lightsworn Dominion and used its effect to send Eradicator Epidemic Virus from his Deck to his Graveyard. He then sent Imperial Order, Wyverburster, and Thunder Dragon Dark from the top of his Deck to his Graveyard with Curious’s effect. He Tributed Dragonroar to Summon Colossus to his field and then used Dragonroar’s effect to Special Summon Thunder Dragondark from his Deck. He Tributed Thunder Dragondark to Special Summon another Colossus from his Extra Deck next, and then used Dragondark’s effect to add Thunder Dragonmatrix from his Deck to his hand. He then sent Curious and a Colossus to the Graveyard to Link Summon Knightmare Gryphon and activated its effect by discarding Dragonmatrix. De Obaldia Chained Ghost Ogre & Snow Rabbit from his hand to destroy the Gryphon, and Gryphon’s effect allowed Koschel to Set Eradicator Epidemic Virus from his Graveyard. He then Tributed Batteryman Solar to Special Summon another Colossus and then ended his turn. De Obaldia drew Infinite Impermanence and added it to his hand of Sky Striker Ace – Raye, Reinforcement of the Army, and Upstart Goblin. Koschel flipped Eradicator Epidemic Virus, calling Spells, and Tributed a Colossus to force De Obaldia to reveal his hand and send the Reinforcement of the Army and Upstart Goblin to the Graveyard. De Obaldia activated Infinite Impermanence from his hand to negate Colossus’s effect and then Summoned Raye. He used it as a Link Material to Summon Sky Striker Ace – Hayate and attacked directly, sending Sky Striker Mobilize – Engage! to his Graveyard with its effect. He Link Summoned Kagari next, and used its effect to add Engage back to his hand. He activated Engage to add Eagle Booster to his hand and then used Kagari as a Link Material to Summon Shizuku. He Set Eagle Booster and then added Sky Striker Mecha – Widow Anchor from his Deck to his hand in the End Phase with Shizuku’s effect. Koschel banished Thunder Dragon Fusion from his Graveyard to add Thunder Dragonduo to his hand. He Special Summoned it to the field by banishing Thunder Dragondark and Thunder Dragonmatrix from his Graveyard, and used their effects to add another Dragonmatrix and a Dragonhawk to his hand. He then discarded the Dragonhawk to Special Summon Thunder Dragonroar and Normal Summoned Thunder Dragonmatrix. He sent Dragonmatrix and Dragonroar to the Graveyard to Link Summon Some Summer Summoner and used the Dragonroar’s effect to Special Summon Thunder Dragon to his field. He used Thunder Dragon Fusion to Special Summon Thunder Dragon Titan next, and then Tributed the Thunder Dragon to Summon another Colossus. Thunder Dragonduo attacked Shizuku, and De Obaldia flipped Eagle Booster to protect it. All monsters attacked Shizuku, and even though Shizuku wasn’t destroyed, De Obaldia dropped down to 4100 Life Points. Koschel Tributed his Summoner to Summon Colossus in Main Phase 2 and then ended his turn. De Obaldia drew Forbidden Apocrypha and revealed it! He sent Shizuku to the Graveyard to Link Summon Hayate and then attacked directly with Hayate, dropping Koschel down to 5000 Life Points. 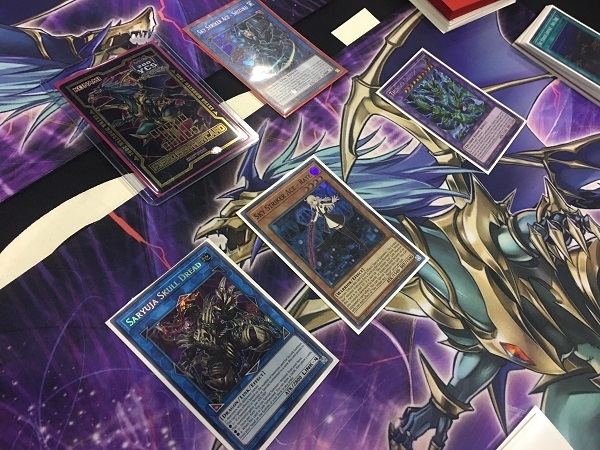 De Obaldia sent an Area Zero from his Deck to his Graveyard with Hayate’s effect. Next, De Obaldia activated Widow Anchor to take control of Titan, and used it to attack Thunder Dragonduo. He then used Hayate to Link Summon Kagari and used Kagari’s effect to return Eagle Booster to his hand. He Set it along with Forbidden Apocrypha and then ended his turn. Koschel drew a card and De Obaldia flipped Forbidden Apocrypha to force Koschel to send all of his Fusion Monsters to the Graveyard! 3 copies of Colossus and a Thunder Dragon Titan were sent to the Graveyard with the flip of a card! Koschel banished Thunder Dragon Fusion from his Graveyard next, using its effect to add Thunder Dragonroar to his hand. He discarded it to return Thunder Dragon Fusion to his hand and used the Thunder Dragon Fusion to return 3 of his banished Fusion monsters to his Extra Deck and Fusion Summon Titan! He then used Monster Reborn to Special Summon Thunder Dragondark and Tributed it to Summon another Colossus. He used the Dragondark’s effect to add Thunder Dragonhawk from his Deck to his hand and then discarded Thunder Dragonhawk to activate its effect. He Chained Titan’s effect to destroy De Obaldia’s face-down Eagle Booster and then Special Summoned Thunder Dragonduo from his Graveyard with Dragonhawk’s effect. He attacked Kagari with Dragonduo to destroy it, and Koschel used Dragonduo’s effect to banish Thunder Dragon from his Graveyard and add Thunder Dragon from his Deck to his hand. Colossus attacked Raye, and De Obaldia used its effect and Tributed Raye to Special Summon Kagari. He used Kagari’s effect to return a Widow Anchor from his Graveyard to his hand, but it was all over moments later! Colossus attacked over Kagari to destroy it, and a direct attack from Thunder Dragon Titan finished De Obaldia off! De Obaldia nearly fights back from an early Eradicator Epidemic Virus thanks to Forbidden Apocrypha, but Koschel retaliates and takes the win! The Match is moving on to a third and final Duel that will determine which Duelist advances to the Top 16! Time in the round was called while the Duelists were Side Decking, so the third Duel will only consist of 4 turns unless Life Points are tied at the end of the fourth turn! A random method was used to determine which Duelist gets to go first, and De Obaldia won the die roll and opted to go first. De Obaldia opened up with Ash Blossom & Joyous Spring, Twin Twisters, Sky Striker Mecha – Eagle Booster, Super Polymerization, and Sky Striker Airspace – Area Zero. He activated Area Zero and then Set Eagle Booster. He used Area Zero to target Eagle Booster and then added Sky Striker Ace – Raye from the top of his Deck to his hand and destroyed Eagle Booster with Area Zero’s effect. He Summoned Raye and then sent it to the Graveyard to Link Summon Kagari. He used Kagari’s effect to return Eagle Booster from his Graveyard to his hand and then Set Super Polymerization and Twin Twisters. He sent Kagari to the Graveyard to Link Summon Sky Striker Ace – Shizuku and used Shizuku’s effect in the End Phase to add Sky Striker Mecha – Widow Anchor from his Deck to his hand. Koschel discarded Thunder Dragon from his hand to get 2 more copies from his Deck and then discarded Thunder Dragonhawk to Special Summon Thunder Dragon to his field. He Tributed it to Special Summon Thunder Dragon Colossus Linked to Shizuku and then banished Colossus from his field and a Thunder Dragon from his hand to Special Summon Titan. He used Thunder Dragon Fusion next, and returned 2 Thunder Dragon cards from his Graveyard to his Deck to Special Summon Thunder Dragon Colossus. He discarded another Thunder Dragon from his hand to activate its effect and Chained the effect of Titan. 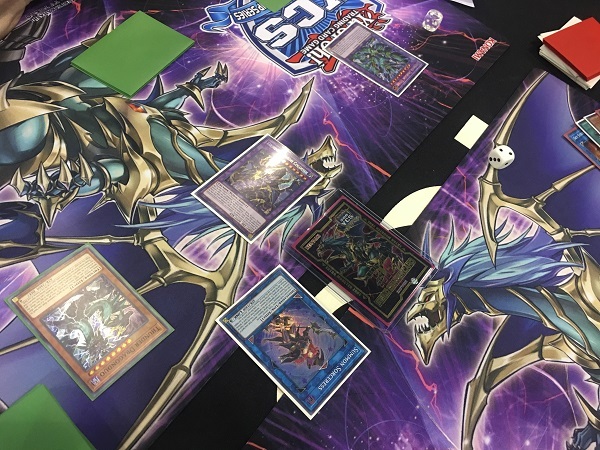 Titan destroyed De Obaldia’s face-down Super Polymerization and Koschel added 2 Thunder Dragons from his Deck to his hand. Koschel Set a card to his back row and then activated the effect of Danger!? Jackalope? in his hand and randomly discarded a Thunder Dragon. He Special Summoned the Jackalope to the field and drew a card. Next, he sent Jackalope and Colossus to the Graveyard to Special Summon Reprodocus and banished Jackalope from his Graveyard to Special Summon Wyverburster. He used Reprodocus to make Wyverburster a Dinosaur and then combined Reprodocus with Wyverburster to Link Summon Summon Sorceress. He added Collapserpent to his hand with Wyverburster’s effect and then activated Allure of Darkness to draw 2 cards and banish a Collapserpent from his hand. He banished Thunder Dragon and Thunder Dragon Colossus from his Graveyard to Special Summon Thunder Dragonduo Linked to Summon Sorceress and then used his Sorceress’s effect to try to Special Summon a monster; but De Obaldia used Ash Blossom & Joyous Spring to stop the Special Summon. Koschel Special Summoned Collapserpent by banishing Thunder Dragon from his Graveyard next, and then Dragonduo attacked and destroyed Shizuku, dropping De Obaldia down to 6500 Life Points. Koschel banished Allure of Darkness from his Graveyard to add Thunder Dragondark to his hand with Dragonduo’s effect, and De Obaldia Special Summoned Raye from his Graveyard. Summon Sorceress attacked Raye next, and De Obaldia Tributed it to activate its effect and Special Summon Sky Striker Ace – Kaina from his Extra Deck. He used Kaina’s effect to stop Titan from attacking that turn, and Summon Sorceress continued its attack to destroy Kaina, dropping De Obaldia down to 5600 Life Points. Collapserpent attacked directly next, dropping De Obaldia down to 3800 Life Points. In Main Phase 2, Koschel Tributed Collapserpent to Summon Thunder Dragondark and used Collapserpent’s effect to add Wyverburster to his hand. He Tributed Thunder Dragondark to Special Summon Colossus Linked to Summon Sorceress and then used Thunder Dragondark’s effect to add a Thunder Dragonmatrix to his hand. De Obaldia drew another Eagle Booster and Koschel flipped Eradicator Epidemic Virus and Tributed Colossus, calling Spells. De Obaldia had a Twin Twisters and Area Zero on his field, plus a hand consisting of 2 Eagle Boosters and a Widow Anchor. The Virus threatened everything! He Chained Widow Anchor targeting Titan, then flipped Twin Twisters, discarding Eagle Booster to destroy his own Area Zero. Koschel Chained the effect of the Thunder Dragonmatrix in his hand, and then Chained the effect of Titan. He used Titan’s effect to have it destroy itself, and all of De Obaldia’s cards were sent to the Graveyard. He Special Summoned Raye with the effect of Area Zero, and that’s all he had left! Jonas Koschel defeats the former World Champion and advances to the Top 16 with his Danger! Thunder Dragon Deck!